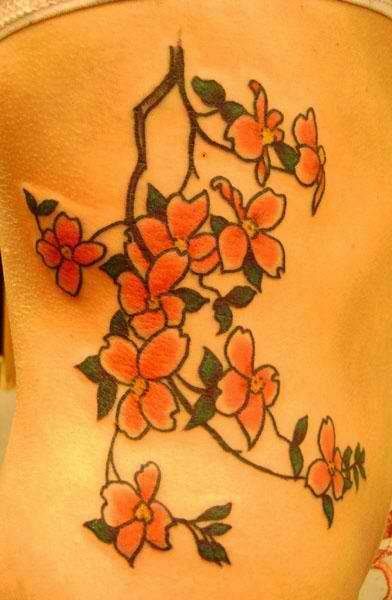 Tattoo of cherry blossom flowers with leaves hanging off of thin little branches done on the side of a girl’s body. Red cherry blossom flowers with white edging that are also outlined in black give these designs a more bold look than just the color alone. The flowers are also accented with little yellow centers and dark green leaves. This image is placed on the side of her body so that the branches are hanging down like they are still on a tree. It wouldn’t be difficult to add other elements to this tattoo like more branches and white buds or adding the trunk and roots to this branch. The little leaves are a nice contrast to the bigger flowers too.